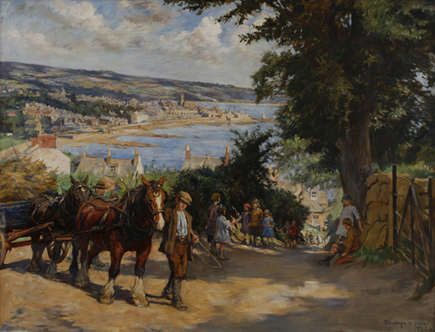 This was an exhibition that I really couldn’t miss: a celebration of the collection of my hometown museum to mark the twentieth anniversary of its expansion from a small collection of Newlyn School artworks into a fully fledged museum and gallery with collections of fine and decorative art, social history, photography and archaeology. I still haven’t learned to speak the language of art – and I probably never will – but I’d love to show you some of the paintings and tell you some of my thoughts. This is a painting I love for its own sake and because the scene is so familiar. I have walked up and down those steps so many times, my best friend lived just a few minutes walk from the top of the steps, and the Man of the House recalled that his grandfather lived in that part of town too and his father told him that he learned to swim in that harbour basin. 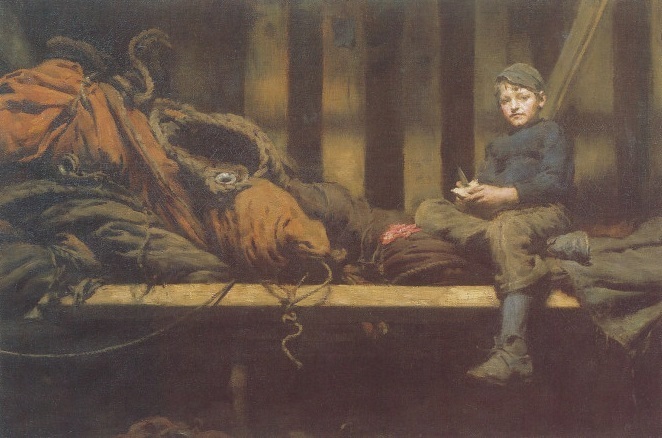 This is such a striking portrait; and it reminded me of a very recent photograph of a group of fisherman in a net loft, in a photographic book published a few years ago to raise finds for the Fisherman’s mission. And this is the donkey from the exhibition poster. It was suggested that there might be a link with the writer Derek Tangye, and the Man of the House wondered if it might be an ancestor of the donkeys he knew when he worked out at the National Trust’s Botallack base. The hallway was filled with photographs from a recently acquired collection. We were particularly taken with an early photograph of St Michael’s Mount Boatman. Their uniforms were remarkable, and most have been horribly cumbersome. Mount jobs were often passed down through families and the Man of the House thought he could see resemblances to one or two of the boatmen he knew as a child. 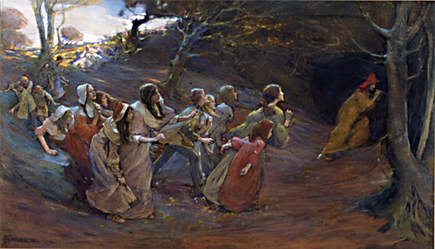 A number of the paintings on display were chosen by the gallery’s small army of volunteer stewards, and the next painting was the most popular choice. I have to commend their taste; and tell you that my father grew up in a house on that hill. As we moved through the galleries we saw that the paintings were moving forward in time. I was thrilled to see a painting by an artist who is a particular favourite ‘in real life’ for the first time. And maybe even better, a beautiful illustrated book that she prepared for her children was on show in a cabinet. There were some lovely sketches by Norman Garstin there, as well as a cartoon by his writer son, Crosbie, showing the artist followed by his daughter Alathea – another artist – and a string of pupils. I wish I could show you that cabinet, but I can’t. 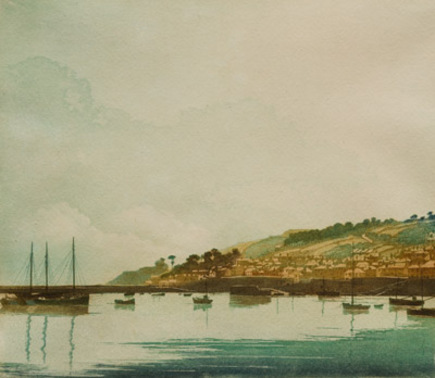 And, before I leave Elizabeth Adela Forbes behind, I must tell you that her drypoint etchings are quite wonderful. 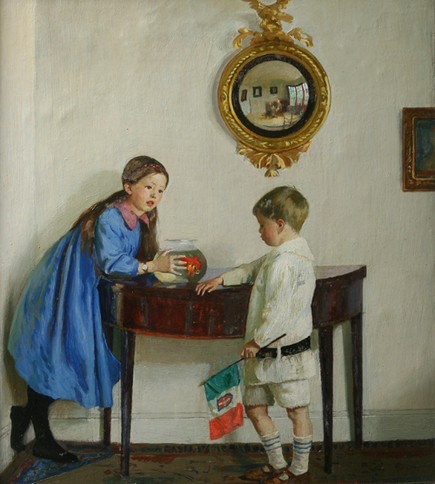 I know that Harold Harvey is much loved, and a particular favourite of the Persephone Post, so I had to show off one of his paintings from this exhibition. I chose this one because I saw that it was a bequest from one of the subjects, Miss Laura Jewill Hill. One painting that I particularly liked was a bequest from Doctor Eric Richards. I spotted more of his bequests, I have a number of books from the library book-sale that came from his collection, and I have to think that we have very similar tastes. Upstairs, we saw the most contemporary works. Some were by artists still alive and working, and we spotted two artists whose paintings we own. 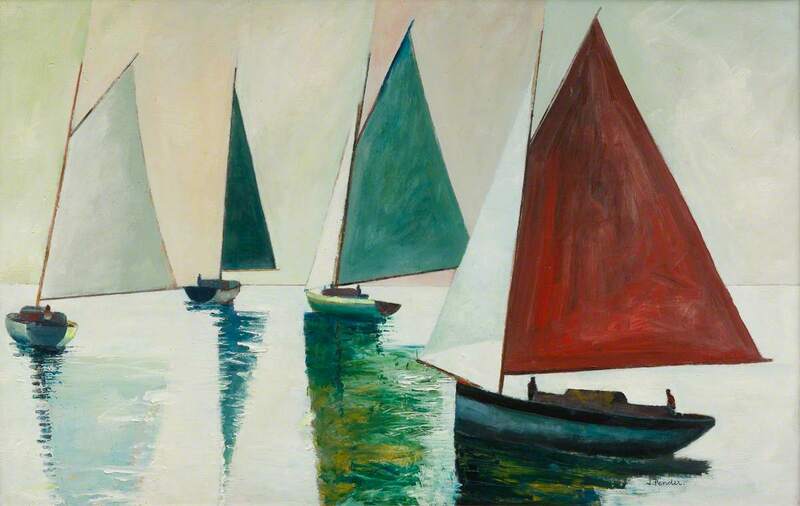 Bob Vigg was a friend of my godmother, Michael Praed was one of my mothers teaching colleagues before he began to paint full-time, and I must confess that we liked our own paintings a little more than the works in the exhibition. There was a great deal of wonderful work in this gallery, and it was here that I saw how certain artists had influenced others. I loved this view of my hometown. I have always loved Jack Pender’s work. And this lovely sunset, over the lighthouse that inspired the young Virginia Woolf, seems to be the right place for me to stop. A Casket of Pearls runs until 3rd June 2017. Do visit if you have the chance. There is so much wonderful work, and art is so much lovelier, so much more alive, face to face than it can ever be in a book or on a computer screen. Love these paintings. If I could choose one it would be Forty Winks. Thank you so much for sharing. 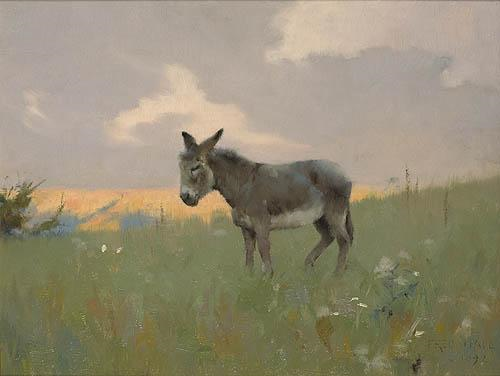 There’s definitely something about that donkey – it was the chosen image for the exhibition poster. How especially wonderful to see paintings of places you’re so closely connected to! It was lovely to see this exhibition through your eyes. Thank you. 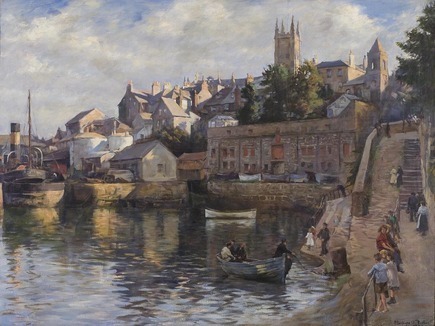 We’re very lucky that so may artists have been drawn to West Cornwall by the quality of the light. A lovely post on a lovely exhibition! Thank you for sharing these, and your connections to them period I think my favorite is the Jewel Hill children. It was a particularly lovely exhibition and there were many other images I would have loved to shared but have had to save for another time. I truly love these paintings, especially the more traditional land and sea scapes, and that donkey portrait. Your area attracted many talented artists whose works are featured in this post and in the show. We are very lucky to have both lovely scenery and light that appeals to artists. The rooms of landscapes and seascapes were wonderful and I wish I could have spent longer there. Such lovely collection..I cannot decide which one I like more than the other! Thank You so much for sharing! Thank you. I know I’m very lucky to have such a lovely gallery on the doorstep, and I hope you’ll be able to visit again one day. Oh I love the Penlee Gallery and it’s annoying I won’t be down again in time to catch the exhibition. Hopefully they’ve done a book and I can get that next time I’m down. I love the cubist view of Penzance; I think that’s my favourite. There was no sign of a book but there was a listing of the exhibits and most of then should be on the museum website, It’s not the same of course, but it will give you an idea of what was there and what else there is in the collection. The cubist view was a lovely contrast to the earlier works that came before, but I must confess that we both looked at it and thought what a pity it was that half the harbour was filled in to make a car park. Beautiful! They’re all wonderful but I especially like the Ken Symons. I’ve glad you like it – for me it looks like another world and yet it is recognisably home. What stunning pictures, Jane. I won’t be able to get to this, but thank you for sharing it with us – I particularly loved the Ken Symons image! I think if this was a vote Ken Symons would have won! There were so many lovely pictures and it was one of the ones I didn’t know that really caught me eye. I have to look now to see what else he did. What a wonderful exhibition! How fantastic to live in a place so old or historic that you can recognize so many places in these paintings. 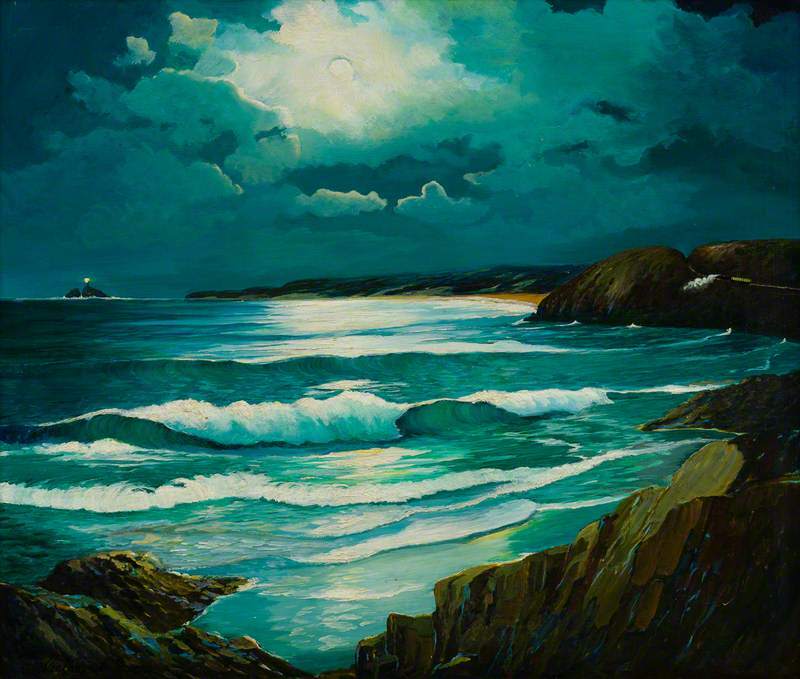 I think my favorites might be a toss up between Laura and Paul Jewill Hill-I would love to know what that conversation is about-and Godrevy Lighthouse, Carbis Bay-because I love the atmosphere it creates. What a marvelous collection of treasures. Isn’t it wonderful to go beyond the big names and discover these lesser-known artists? Especially when they paint a place that you know and love so well. Oh it looks divine. I read all Derek Tangye’s books as a child so the Forty Winks is possibly my favourite !